Well, here's something you can't say often: For a few days in late January, Chicago and Minneapolis were colder than the North Pole. The "polar vortex" weather system brought Arctic air into the Midwest that registered between -10 degrees and -25 degrees Fahrenheit, with wind chills of -40 degrees—conditions deemed "once in a generation"—and caused extra effort for planners and suppliers working on meetings across the region. In Chicago, one of the world's largest biotechnology firms held a two-and-a-half-day national sales meeting for nearly 1,500 reps in its bone and cardiovascular business unit that began on the morning of Tuesday, January 29, at the Hyatt Regency Chicago. Most of the attendees had their travel to the meeting impacted by weather delays into Chicago; some reps did not get there until Tuesday evening. For Wednesday evening's awards dinner and gala at the Field Museum of Natural History, event organizers constructed tents from the curb to the museum entrances, which were up a few sets of steps, to shield attendees from wind chills that would cause frostbite in minutes. And at the Hyatt Regency, attendees were lined up roughly 50 at a time inside the lobby; as each coach moved forward at the porte cochere, they were moved quickly out the door and onto the coach. Some attendees had to stay an additional night at the Hyatt because of reduced flight traffic in and out of Chicago airports. Overall, though, the meeting was not short-staffed, even with Chicago train and subway lines shut down for a while because of the cold, according to the hotel. 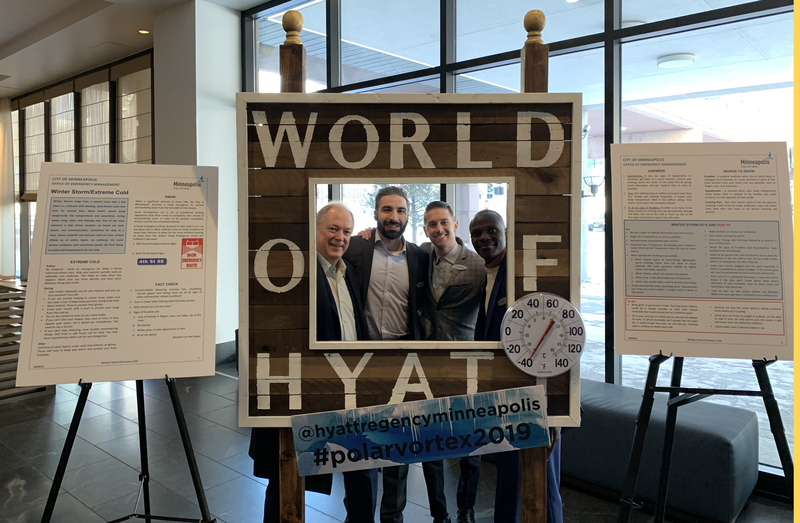 About 410 miles to the northwest, the 2,100-attendee Bethlehem Conference of Pastors was taking place at the Minneapolis Convention Center Tuesday through Thursday, but did not have to contend with the frigid elements thanks to the skyway that connects the convention center to several downtown hotels, restaurants, and shops. But the Hyatt Regency Minneapolis played host on Wednesday and Thursday to about 200 HelmsBriscoe planners for a familiarization tour, and opted to turn the weather situation onto a memorable element, according to Madonna Carr, CMP, vice president of destination services for Meet Minneapolis, the convention and visitors association. "They did a walk-in picture frame with the tagline, 'I Survived the Polar Vortex,'" she said. "After all, those folks experienced some history while they were here. These are some of the coldest temperatures we have ever had." 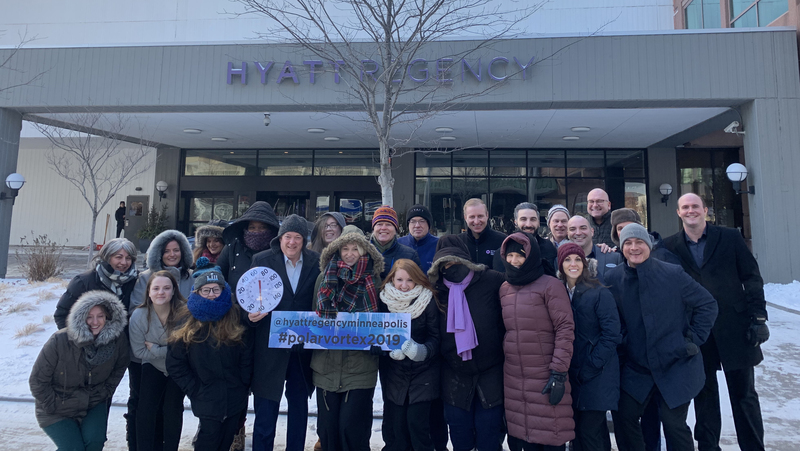 A few hardy attendees at a HelmsBriscoe familiarization tour at the Hyatt Regency Minneapolis ventured outside for a (very) quick photo.